WOW !!! 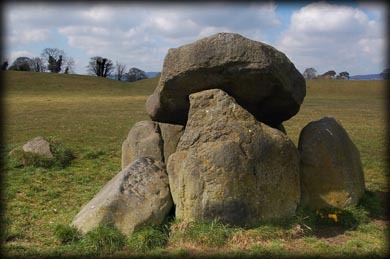 The henge at Ballynahatty is just so impressive, measuring almost 200 metres in diameter with an embankment almost four metres high in places this henge is an enormous ampitheatre with the remains of a passage tomb as a focal point. 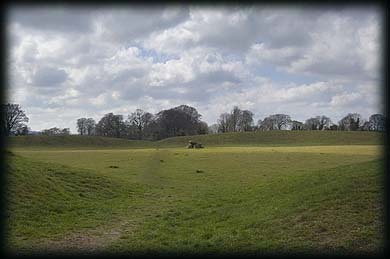 The henge which was excavated in 1954 is made up of clay, gravel and boulders and these excavations also showed the presence of an inner ditch. There are five small gaps in the embankment of which three are thought to be original entrances. 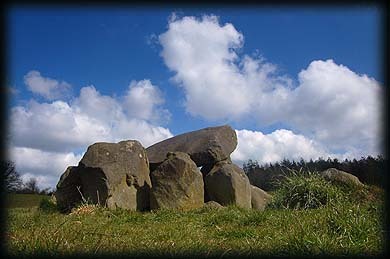 Dating to the late neolithic or early bronze age the henge is thought to be part of a ritual complex situated around the Lagan valley. 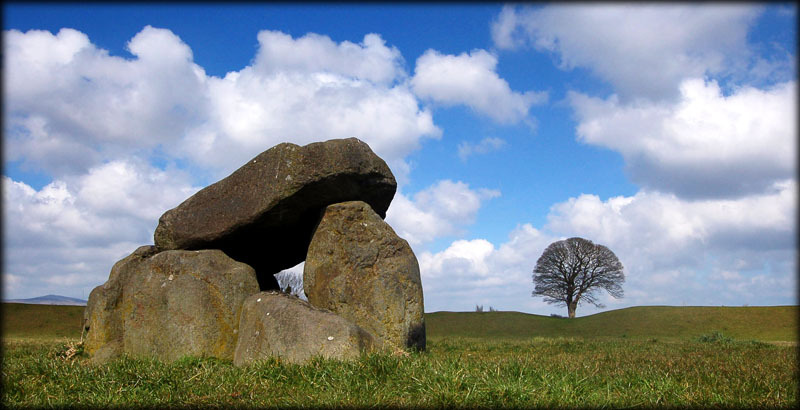 Located slightly off the centre of the henge is the remains of a passage tomb, the small compact chamber is still intact, although the roof stone has slipped creating a more dramatic dolmen like structure. In the image shown left the entrance to the passage is to the left side of the image, as the passage was western facing. In 1989 evidence of an oval double pallisaded structure was found in the field south east of the ring. The giant's ring is now used a a local community park, for dog walking and general recreation, luckily for me there not too many dog walkers on my visit, but no matter how many people turn up this monument cannot fail to impress. Situated: Easy. From the south take the M1 north, then take exit six at Lisburn onto the A3, then a right on to the B23 through Hillhall, keep on this road for about six kilometres until you see the signs on your left for the giant's ring. There is ample car parking. Discovery Maps 15, 20: J 3275 6777. Last visit Apr 2008.